Peggy Watkins paints from her home’s circa-1835 kitchen house. A work-in-progress, The Prize, is on her easel. Peggy Watkins always starts with the eye of the hunting dog. Or elephant. Or lion. An avid traveler and wingshooter with a “bush home” in Zambia, Watkins is not your typical coastal-city painter. The former CPA, whose girlhood love of art took a back seat to a practical accounting job, didn’t start her painting career until age 38. It began serendipitously: in 2003, she and her husband, Todd, happened to move into a home across the street from the Atlanta College of Art. Night classes there led to private training, and in 2008, the Southeastern Wildlife Exposition (SEWE) selected her as its featured artist. Charmed by Charleston, she relocated here in 2013 and this year can be found exhibiting in SEWE’s Fine Art Gallery in Belmond Charleston Place. Beginning to paint: I’d always been artistic, but my dad, who was in the military, said, “no way,” when I wanted to go to art school, so I majored in accounting. After I started taking classes at Atlanta College of Art, I knew I had to get back to it. On sporting art: I happened to paint a hunting dog from a photo for an art show. A man at the show, Richard Thomas, said, “If you’re going to paint hunting dogs, you need to learn about what they do.” He invited Todd and me to his property in Albany, Georgia, and I met his English setters. For about five years, I only watched them hunt. He finally convinced me to start shooting. And I was good! Life lessons: Richard taught me that I needed to learn about the full circle, from puppy to full-fledged bird dog, and the relationship the dog develops with the quail and the shooter. It’s an honor to shoot over a fantastic gun dog and have the retrieved quail brought to you—that completes the circle. The larger circle includes habitat, land management, and of course, love of the land and its inhabitants. Annie Oakley Charleston: In Atlanta, I joined a group of women who called themselves the Annie Oakley Shooters. When I moved to Charleston, the leader said I should start one here. We meet for a sporting clay shoot every second Tuesday of the month at 9:30 a.m. at Kiawah Sporting Club. Vacationing in Zambia: As a kid, I loved African animals. In 2000, I finally made it to Africa on my honeymoon, and then Todd and I went back five years in a row. On the fifth trip, our guide suggested we build a home. We negotiated with the chief to acquire land across the river from the national park, and our guide built the house (without using any electricity!). 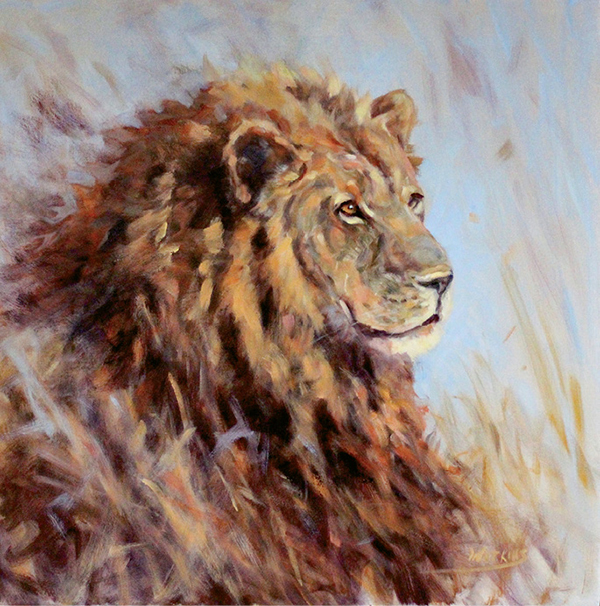 Watkins’s King, oil on canvas, 20" x 20"
Lion spotting: They are so majestic and prolific, so natural in that area. You can drive right up to them—10 yards away! Starting a work: I begin with the eyes. Once they’re in, they start talking to me, and I just start placing the correct brushstrokes with the correct color and correct value all around them. I work close, so it looks very abstract; when I pull away, it comes together.